When land-trust staffers get together, they can sometimes sound more like a group of real estate lawyers than environmental advocates. The deals they broker are complicated, but they use a few basic tools over and over again. A conservation easement is a legal agreement between a landowner and a land trust. It permanently restricts the type and amount of development on a piece of property. The landowner keeps the title to the land, but donates his or her development rights to a land trust. In exchange, the land trust agrees to enforce the easement "in perpetuity." Easements are usually held by nonprofit trusts, but they can also be held by federal and state agencies; conservation easements in their current form have been used since the 1960s, when the IRS first recognized that donated easements were tax-deductible. Land trusts sometimes buy easements, an arrangement called a purchase of development rights or PDR. The money helps to draw in cash-poor ranchers, says Joni Clark of the Gunnison Ranchland Conservation Legacy in Gunnison, Colo., but only if they're already interested in protecting their land. "The cash is a big call to them, but just walking up to a rancher's face and offering them cash doesn't work, because these guys have not sold out yet," she says. "They want to ranch." The federal tax code allows landowners to use the money from easements for tax-free land purchases. Some trusts, like the Montana office of The Nature Conservancy, encourage owners to reinvest the money in properties next to the protected lands. A few land trusts, usually smaller groups, call themselves easement brokers. They negotiate conservation easements with local landowners, but they don't enforce the agreements. Instead, they ask a larger group to "hold" the easements, or take legal responsibility for them. The advantage of this strategy is that the smaller land trusts can maintain their close ties to their communities, but they can also count on the money and staff of larger groups to back them up. "It's not as efficient for getting deals done, since you have to get other people excited about your backyard," Kevin Essington of the Montezuma Land Conservancy in southwestern Colorado says of the broker idea. "But for a starting land trust, it's the best way to do it. I can't imagine any other way." Some land trusts purchase property or accept donations of property. Managing property demands more time and money than holding easements, so trusts that acquire land are usually well-established and well-funded groups. 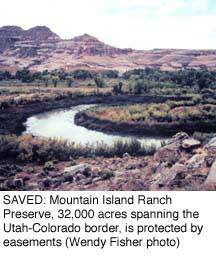 The Nature Conservancy, for instance, manages 1,340 preserves in North America, the Caribbean, Asia and the Pacific. When an important piece of open space goes on the market, land trusts sometimes help to find conservation buyers, individuals or groups interested in preserving the property they buy. Conservation buyers usually, but not always, establish a conservation easement on their land. Certain land trusts sell or donate their land acquisitions to public agencies. The Trust for Public Land puts all of its property in the hands of federal, state or local governments; the Wilderness Land Trust, based in Hood River, Ore., buys wilderness inholdings and sells them to the Forest Service or the Bureau of Land Management. Since agencies are not permitted to pay more than the appraised value of the land, trusts usually sell the property at a loss. Trusts can also act more quickly than public agencies, so they often step in when a piece of property is threatened by fast-moving development. After they purchase the land, they protect it until an agency can budget enough money to buy it from the trust. Some land trusts may also use their local clout to help a public agency negotiate a direct purchase of land. Partnerships between land trusts and public agencies are becoming more common. Many agencies, such as state wildlife departments, hold easements on their own or in cooperation with nonprofit land trusts. Some states and counties also put a percentage of their tax revenues or other earnings towards open-space acquisition; these funds are often given to individual land trusts for the purchase of easements or properties. Great Outdoors Colorado, a state trust fund, has put almost $30 million in lottery dollars towards open-space protection over the last five years. The fund has also spent nearly $200 million on parks, recreation, and wildlife projects.